On June 20, Secretary Wang Yang of CPC Guangdong Provincial Committee conducted a special survey in Dongguan. Joining him were Lin Musheng, member of the Standing Committee and Secretary General of Guangdong Provincial Government, Vice Governor Liu Zhigeng of Guangdong Province, and Dongguan municipal officials Xu Jianhua, Yuan Baocheng, Liu Yuquan, Yao Kang, Huang Shuangfu, Zhen Ruichao, Cui Jian, Liu Weifang, Liang Guoying, Deng Zhiguang, Wang Jianyang and Pan Xinchao. Secretary Wang Yang and his party visited Dalang Suboffice of Industry and Commerce, Songshan Lake High-tech Zone and Dongguan Downtown Luosha Community, and inspected the Three Crackdowns and Two Establishments, business registration reform, industrial development and rural grassroots management system reform of Dongguan. On the morning, Secretary Wang Yang and other officials were debriefed by Liu Ning, deputy secretary general of Dongguan Municipal People s Government, secretary of Songshan Lake (Biopark) Party Working Committee and executive deputy director of Songshan Lake (Biopark) Administrative Committee. Songshan Lake Taiwan High-tech Park was initiated by Secretary Wang Yang in June 2009. Attaching great importance to the development of the Park, he met with Taiwan high-tech enterprise delegations to Songshan Lake three times and introduced the investment environment of the Park when it was first established. Liu Ning gave an introduction to the development results, construction progress of supporting facilities and key projects, and outlook of the Park. He revealed that the Park would focus on the development of smart manufacturing, strive to grow into a Cross-straits new industry cooperation model demonstration zone featuring simultaneous upgrade and collaborative innovation, and a Cross-straits demonstration zone of software and hardware industry cooperation. After the report, Secretary Wang Yang and his party met with the Taiwan-California Biotech Delegation led by Xuan Mingzhi, Honorary Vice Chairman of UMC. Song Tao, adviser to Dongguan Municipal People s Government, joined the meeting. Xuan Mingzhi and members of the delegation pointed out the features and development trends of biotech industry, and put forward ideas and conceptions to cooperate with Guangdong based on their practical conditions. They hoped to learn about the investment environment of Guangdong Province and seek for cooperation opportunities through this visit. Sescretary Wang Yang revealed that Taiwan-invested enterprises have partially or wholly transferred their production capacity to the Pearl River Delta as required by the global industry transformation and upgrade since the opening up and reform. Gaining huge room for development in electronic information, they have accelerated the industrialization process of Guangdong Province, and promoted the leapfrog development of Guangdong s economy. Since the 21st century is a biotech era, closer cooperation in biotech between Guangdong and Taiwan complies with the transformation and upgrade demands of Guangdong, and constitute a new carrier for win-win Cross-Straits cooperation. Guangdong will further optimize its soft environment and provide a good platform for biotech industry to take root in Dongguan and Guangdong Province. After 30-odd years of development, Guangdong now can fully support the industrial transformation and upgrade, expansion and biotech industry and other emerging industries, Sescretary Wang Yang pointed out. 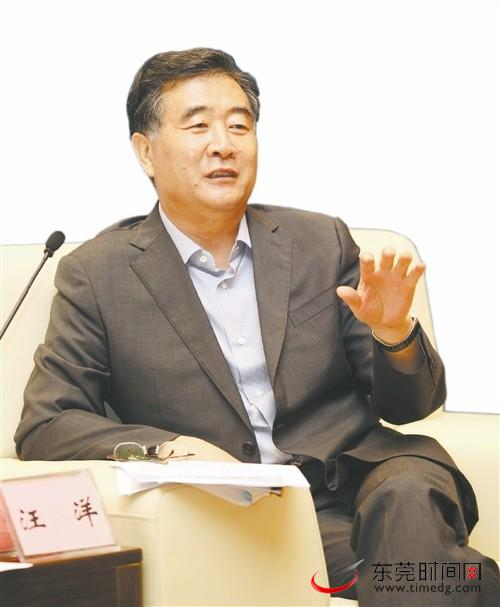 He hoped that the tremendous research strengths and capabilities of these enterprises could be combined with Guangdong s market, industry, system and conceptual strengths, and more quality resources and projects introduced to Dongguan and Guangdong for collaborative innovation, closer cooperation, cluster-based development and ultimately formation of an industry chain.